The Wii U remake of The Legend of Zelda: Wind Waker has a bunch of new tweaks and features, if previews out of Germany are to believed. Reporters and attendees at GamesCom this week got to play the first-ever HD Zelda, which comes out for Wii U in October. They say it's different. Much different. Nintendo has streamlined this divisive quest to speed up the later sections of Wind Waker. But how much faster is it really? The original required players to find and translate eight IN-credible charts, and seek the assistance of the whimsical Tingle, who would then charge 201 Rupees for each translation. According to a representative on-site, five Triforce pieces can now be grabbed directly, and only the remaining three will require translated charts. But what else has Nintendo altered in this remake? Well, they introduced Hero Mode. 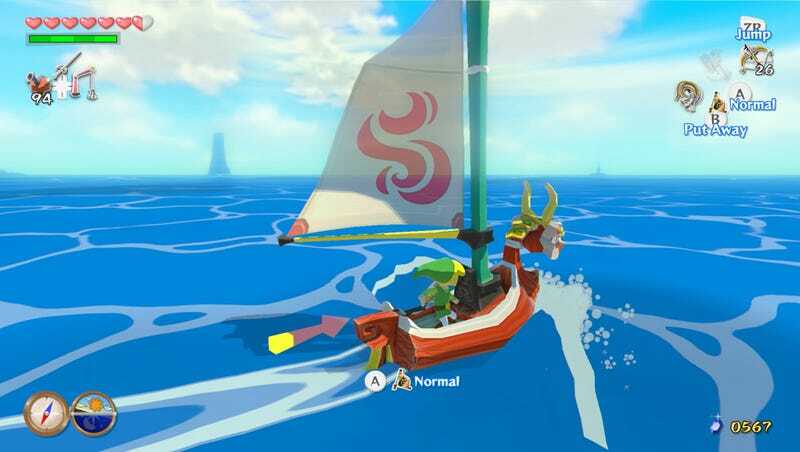 Similar to the mode of the same name in Skyward Sword, it will present Wind Waker experts with a more difficult version of the game. Enemies hit harder and health can only be regained through the use of potions. Also, surprisingly, this Hero Mode is also available for players right from the start of the game and can be switched on or off at file select screen. Sure, it’s no Master Quest, but it’s hard to see Nintendo consider a redesign that expansive for an HD remake. And yet, after testing my luck playing the "right" way, I decided to take a different approach to Wind Waker. I switch over to Link's bow and arrow and took careful aim in the first-person view by tilting the Wii U Game Pad just so and started taking out enemies from across the room. And then I noticed that Link now has a newly acquired ability to move while in first-person mode rather than being limited to panning around. So I stayed in first-person mode, plinking bad guys from a distance and shooting them again when they recovered. I completely cleared out the walkways above the temple's floor this way, switching to melee controls only when an armored Darknut began bearing down on me. But once his armor was off, a brace of arrows took him down. What really struck me is not that Wind Waker works as an FPS but rather that it works damn well. Speaking as someone who's spent 150 hours or so firing enchanted bolts into bandit hordes in Skyrim, I found Link's enhanced archery skills to be every bit as second-nature as his dynamic swordplay. I take back some of my recent criticisms of Wii U's Game Pad; while it still has its issues, it works beautifully for first-person gun- (and arrow-) play. There's also something called the Swift Sail that will speed up your sailing, as we've known for a while. No new dungeons, sadly. Check out both IGN and USGamer's previews for a thorough look at how Wind Waker has changed.